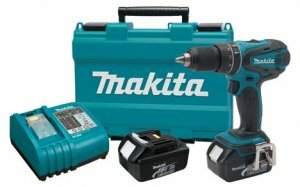 Tool Blog Manufacturer News New Makita Impact and Drill In Mid-Range Line? The new drill is significantly smaller than the BHP454, which is what I consider Makita's top of the line drill, but the performance numbers of the LXPH01 on paper are also lower. What has me more perplexed is that the LXPH01 is an upgrade to the LXFD01, which sells on Amazon for about $40 more than the BHP454. I don't know what the price of the LXPH01 is yet, but it would be hard to beat the price of the BHP454 at around $250. With the LXDT04 Impact Driver I see some of the same issues as with the drill. It is a tad smaller than the previous model – 1/16” smaller – and has a drop in power. The most noticeable loss is the 3-speed selectable feature of the older LXDT01, as well as the brushless motor technology. However, unlike the drills, It looks like the impact will cost less than the older more powerful model. I think the real problem here is Makita's numbering system. I can not tell just by looking at the model numbers what class these tools fall into. Even the white tools are numbered too similarly to the green tools. These could be great tools for the price, but since I don't have the prices, I can not do a comparison.